November 24, 2010 by Cary H.
According to the United States Fire Administration, holiday fires claim hundreds of lives each year and cause millions of dollars in damage to homes and properties. Hopefully none of us will be among those calling our local fire department this season. If you do, however, chances are your will be calling on volunteer firefighters. The National Fireman Volunteer Council states that of all firemen and women in the United States, a whopping 72% of them are volunteers. And who do we have to thank for starting this trend of organized volunteer firehouses? Why Benjamin Franklin, of course, that 18th century jack-of-all-trades. This year marks the 274th anniversary of the founding of the all-volunteer Union Fire Company, which was formally established in Philadelphia on December 7, 1736. 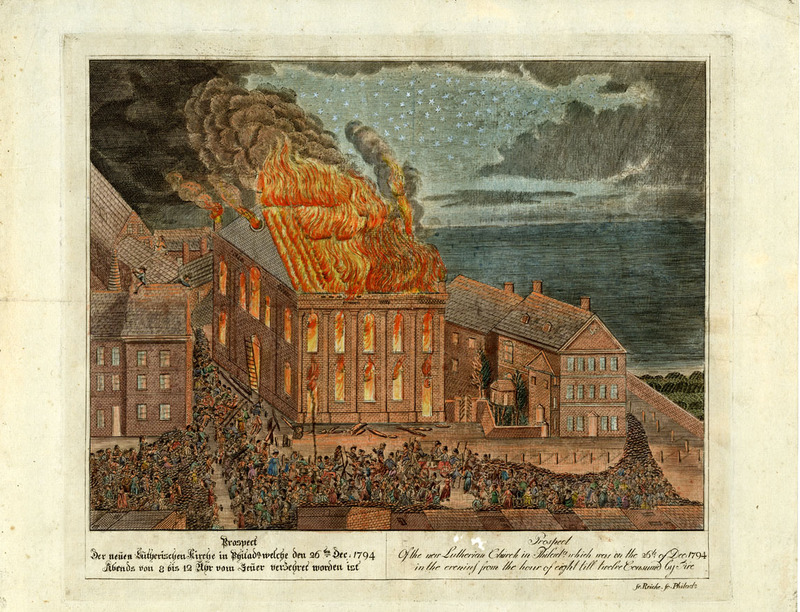 Though men had banned together to fight fires in other cities well before 1736, the Union Fire Company was the first formally organized company. At the helm of its formation was Benjamin Franklin, who announced the city’s needs for fire engines and firefighters in his newspaper, the Pennsylvania Gazette, in the early 1730s. 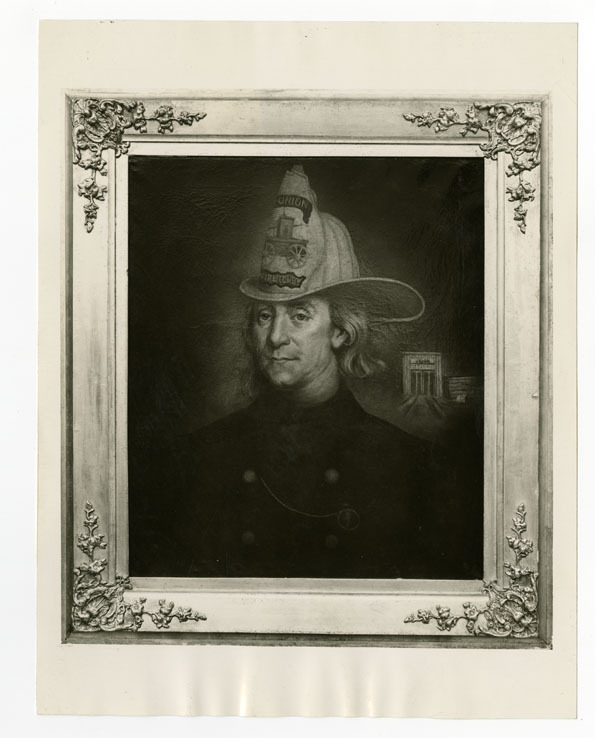 In December 1736, Franklin and twenty-four other citizens, including William Rawle, Edward Shippen, and Benjamin Shoemaker, came together to create the Union Fire Company’s articles of agreement. Unlike other fire societies that generally assisted only their paying members when fires occured, members of the Union Fire Company resolved to help anyone in distress. The Union Fire Company remained very active in the city throughout the eighteenth century. Membership began to decline in the early nineteenth century, however, and the company officially disbanded in 1843. While the Union Fire Company no longer exists, the insurance company that grew out of a fund established in 1750 by Union Fire Company members, including Benjamin Franklin, is still going strong. The Philadelphia Contributionship for the Insurance of Houses from Loss of Fire (now called The Philadelphia Contributionship) is the nation’s oldest fire insurance company. 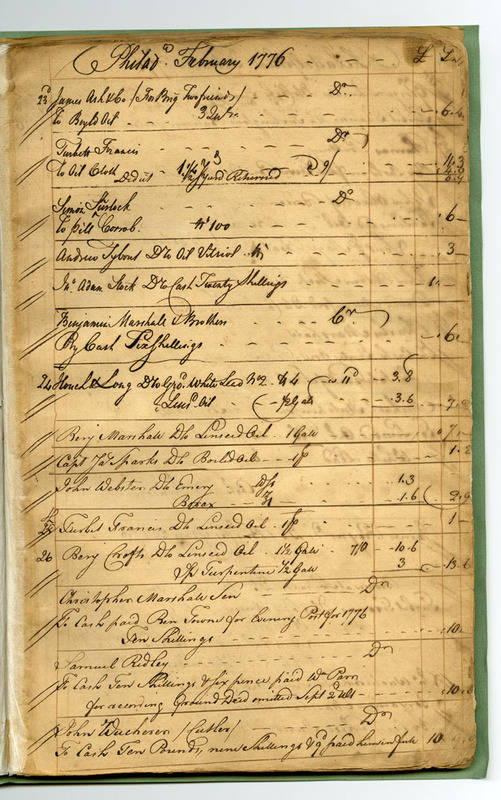 HSP has a significant collection of their insurance survey records dating from 1839 to 1965. So while we hope this year’s accidents are kept to a minimum, if your turkey fryer goes bonkers or you find out a little too late that your Christmas tree isn’t playing nice with your 30-year-old fraying strand of lights, rest assured that your local (volunteer) firefighters are just a phone call away. We hope you enjoy a wonderful and safe holiday!—from all of us at HSP. March 18, 2010 by Cary H.
In terms of processing, the HSP archives department had a good 2009 and is off to a good start in 2010. In this time, staff processed and improved access to almost 50 collections. Following up on Cathleen’s previous post, here are just a few highlights. Others can be found on our website. Benjamin Franklin (1706-1790) was a printer, writer, politician, inventor, and one of the most well-known figures of early American history. He played a significant role in the founding of several Philadelphia institutions, such as the University of Pennsylvania, the American Philosophical Society, and the Pennsylvania Hospital. 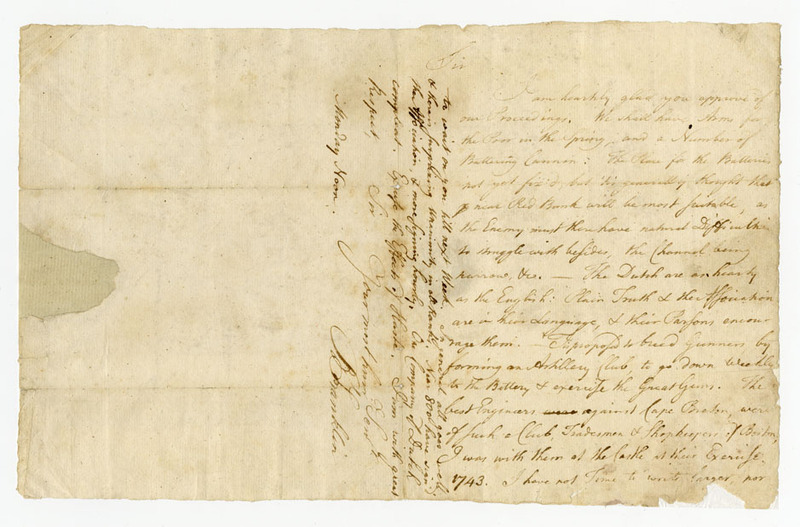 HSP’s collection of Franklin’s papers primarily highlight his later political life, particularly as a representative of Pennsylvania in England (1757-1775) and U. S. ambassador to France (1776-1785). 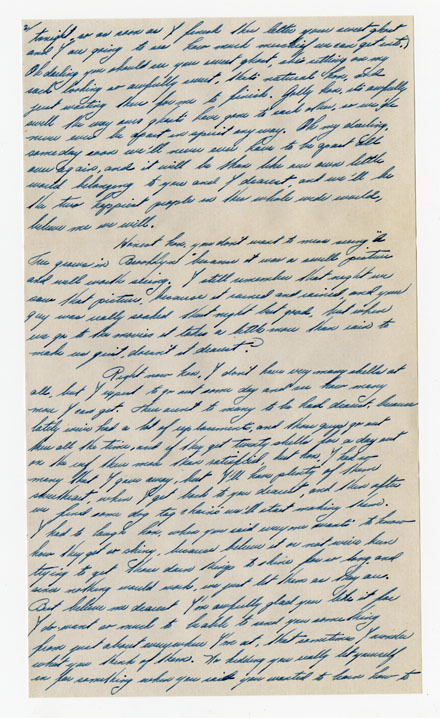 The collection includes a wide range of materials including correspondence, copies of Congressional orders and resolutions, French manuscripts and memoires, certificates, writings, notes, clippings, and ephemera. This collection was supported by Mary Countess of Bessborough. 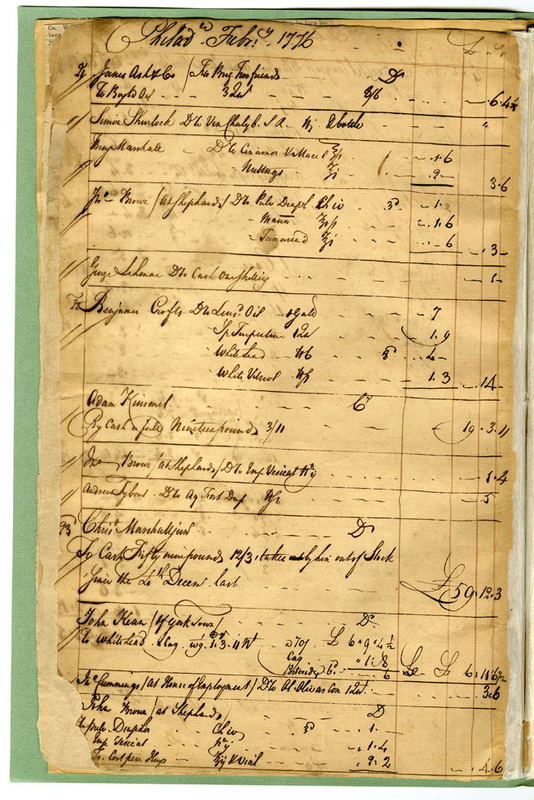 Christopher Marshall (1709-1797) was druggist and chemist in Philadelphia, Pennsylvania. 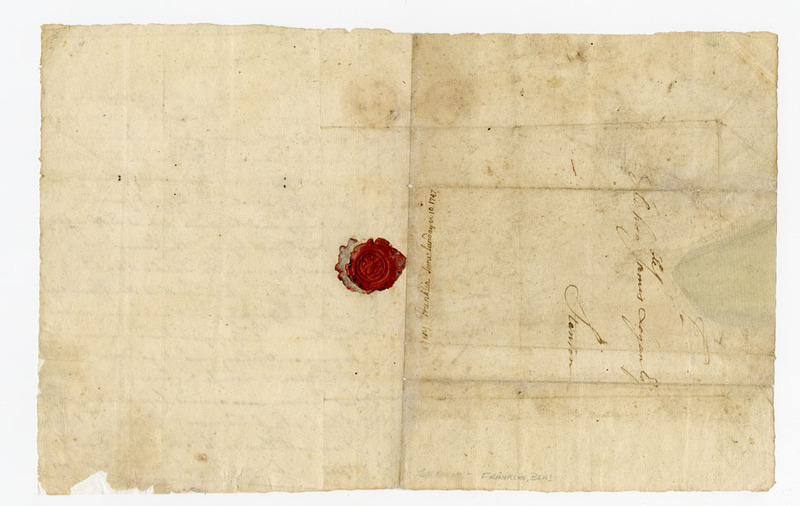 His papers consist of his original diaries from 1774 to 1781 and 1783 to 1785; six bound volumes of photocopies of the original diaries; handwritten transcripts of his diaries from 1782 to 1783, 1786 to 1791, and 1793 to 1795; and two sets of extra-illustrated volumes (seven total) containing pages from William Duane Jr.’s Extracts from the Diary of Christopher Marshall, 1774-1781, illustrations by David McNeely Stauffer, and a variety of original documents. This collection was supported by Dr. Randall Miller. 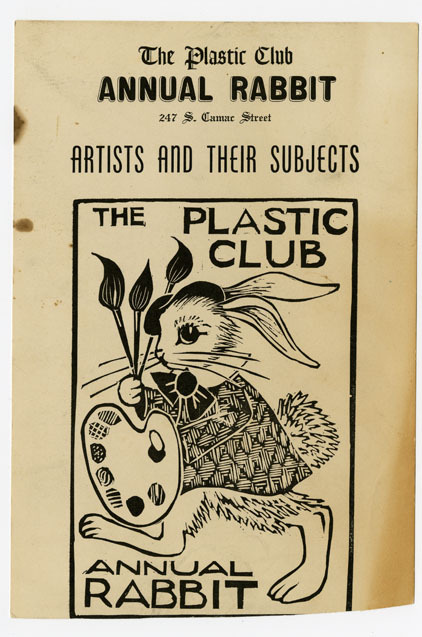 The Plastic Club is the oldest club for women artists still in existence in the United States. It was founded in 1897 in Philadelphia and has included many illustrious members, such as Emily Sartain, Violet Oakley, Blanche Dillaye, Elizabeth Shippen Green, Cecila Beaux, and many others. It has sponsored exhibitions, lectures, and classes, and provided a place for women artists to meet and exchange ideas. The club has also played an active civic role over the years, for example conducting art classes for servicemen during World War II and donating art supplies to underprivileged children. Since 1991, the club has admitted men, who now form close to half the membership. The historical records of the Plastic Club go back to its founding and richly document the club’s activities and members over most of the 20th century. 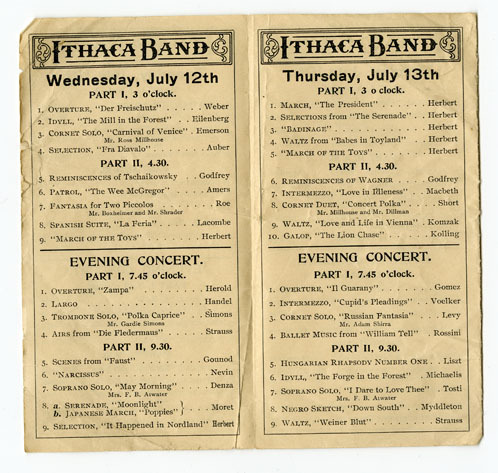 The records include board minutes; annual reports; correspondence; exhibition programs, notices, and reviews; photos from events; directories of club members; files about early members’ artistic activities; scrapbooks of clippings; early sketchbooks and preparatory drawings for a set of stained glass windows; maintenance reports about the building; and a recent graduate thesis about the history of the club that focuses on the building. This collection was supported by Dorothy Del Beuno. Located just north of Philadelphia, Pennsylvania, Willow Grove Park opened in 1896 and was a popular regional attraction and amusement park for several decades. 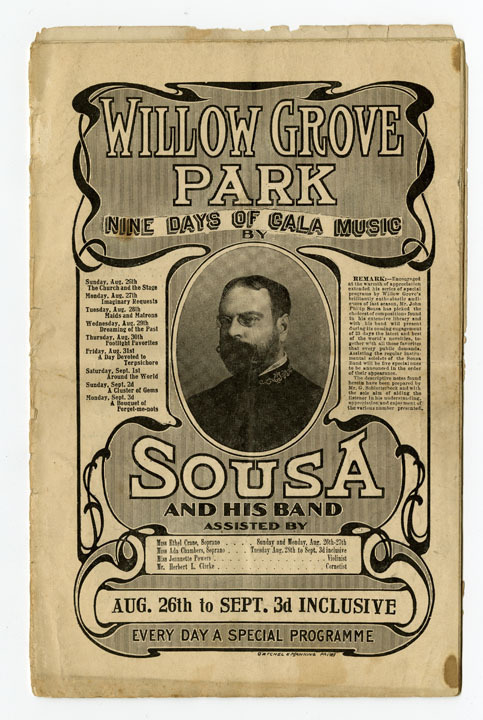 This collection of several hundred concert programs dating from 1904 to 1925 highlights one of the park’s main features that brought popular band leaders such as John Phillips Sousa to the area. This collection was supported by Carol. A. Ingald. Corporal Edward Psulkowski served during World War II as Assistant Crew Chief, 864th Bomb Squadron, 494th Bomb Group, Army Air Corps. 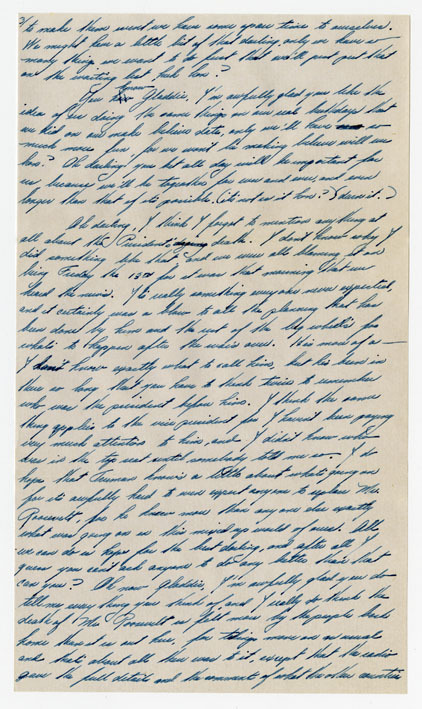 This collection consists primarily of a series of love letters between Edward Psulkowski and Gladys Kramer. 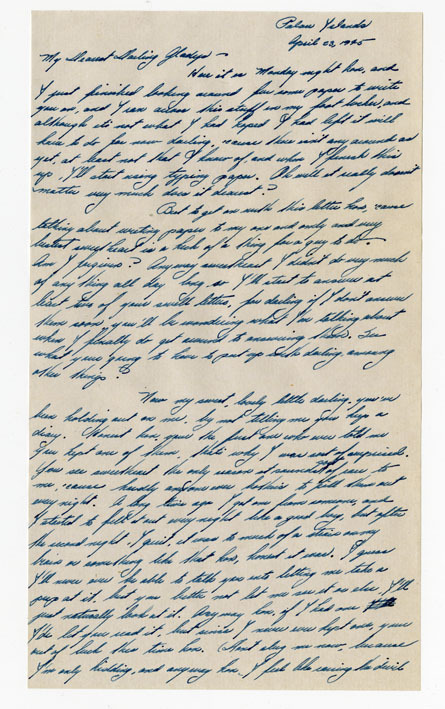 The letters narrate the story of two pen pals who fall in love during World War II. 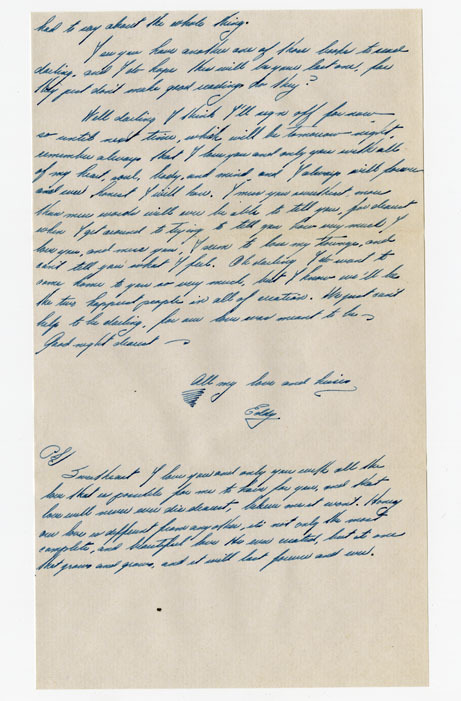 The correspondence and greeting cards from relatives and friends reflect the married life of Gladys and Edward in Elkins Park, Pennsylvania. If you click on the links to the finding aids, you’ll notice some variation of formats (pdf, xml, html). The MacCarley collection represents our most recent foray into Archivists’ Toolkit and EAD. As you’ve seen in other posts, most collections being processed through HSP’s Digital Center for Americana project are also being entered directly in AT. The output looks pretty nice, no?